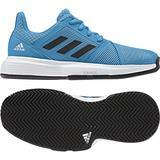 The adidas CourtJam Junior tennis shoes are the everyday, club level player's dream. This sleek, lightweight shoe features a durable design that's perfect for hours of practice and competition. Upper: Features an engineered vamp construction made from TPU and mesh is applied at the toe cap for optimal durability without sacrificing breathability. Midsole: Features an EVA midsole for optimized cushioning and comfort. Outsole: Adiwear™ outsole material offers superior, high-wear durability.